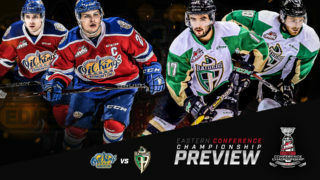 RAIDER REVIEW: The Raiders (41-6-0-2) return to the Art Hauser Centre to take on the Edmonton Oil Kings (27-15-4-4) tonight. 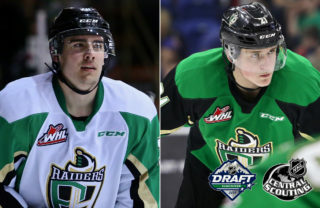 In their last outing, the Raiders wrapped up their six-game road trip with a 7-3 win over the Kootenay ICE at Western Financial Place in Cranbrook, BC. Noah Gregor netted a hat trick while Parker Kelly led all scorers with a four-point night (1g-3a). Dante Hannoun (2g-1a) and Spencer Moe (1g-2a) each had three-point efforts. Justin Nachbaur also had a multi-point game with two assists. Boston Bilous picked up his second win in as many starts for the Raiders, making 13 saves for his fifth win overall this year. 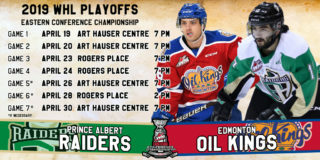 VS. EDMONTON: This is the third contest between the Raiders and the Oil Kings this season. In the last meeting, Cole Fonstad netted the overtime goal to give the Raiders a 6-5 victory at the Art Hauser Centre. 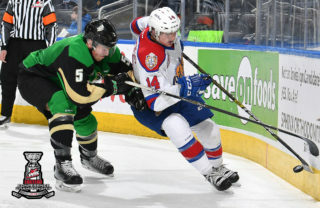 The Raiders have won five straight games over the Oil Kings in Prince Albert. HATS ON THE ICE: After recording 26 games with two goals, Noah Gregor tallied his first career WHL hat trick on Saturday night in Cranbrook against the Kootenay ICE. The San Jose Sharks prospect now has 30 goal on the season, which is tied for seventh in the WHL. Gregor also has 33 assists this season for 63 points, which is second on the team. CAREER BESTS: Spencer Moe and Justin Nachbaur both set new career highs in points on Saturday night. With his second career three-point night, Moe set a new career best with 23 points in a season. He has seven goals and 16 assists on the year. Nachbaur established a new career mark with 22 points following a two-assist effort on Saturday night. The Cross Lake, MB product has 13 goals and nine assists this season. 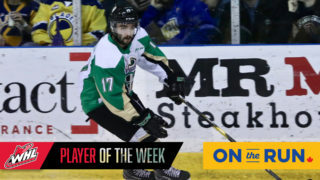 DEFENCE TO OFFENCE: The Raiders scored multiple shorthanded goals in the same game for the fourth time this season on Saturday night against Kootenay. It was also the second time this season that Noah Gregor had a pair of shorthanded goals in a game. The Raiders continue to lead the league with 20 shorthanded goals this season. 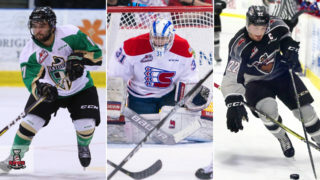 The closest teams are Portland and Red Deer who each have scored 10. NEXT UP: The Raiders are back at it tomorrow night against the Moose Jaw Warriors at the Art Hauser Centre. Tomorrow’s game is the Raiders’ WHL Suits Up with Don Cherry to Promote Organ Donation – Presented by RE/MAX Night. The team will be wearing special Don Cherry-themed jerseys that night. Tickets are available at raiderhockey.com and the Raider Office.